Morning Conversational: What's the Situation at Middle Linebacker? Ohio State entered spring ball with a two-year starter returning at middle linebacker in Tuf Borland, as well as his top two backups. Borland finished third on the team with 67 tackles last season, despite returning while still recovering from an Achilles tendon injury. While Borland got up to speed, it was Baron Browning starting in his place for the first two games. Browning ended up starting three games last year, finding playing time throughout the season. He finished with 23 tackles. Mitchell, a true freshman last season, did not see much time on defense, nor did he record a single tackle. Despite the lack of production, there is nothing but confidence in Mitchell’s potential from his coaches. Borland missed the second half of the spring after taking a helmet to his knee, which allowed both Browning and Mitchell to get plenty of time with the ones this spring. Browning was also out for a couple of practices, allowing Mitchell to get more time with the ones than anybody could have anticipated. By all accounts, Mitchell stepped up this spring and performed commensurate to his lofty recruiting rankings. He is still young, however, and prone to little mistakes. Fortunately for the Buckeyes (and himself), he has enough ability and instinct that he is generally able to overcome his errors. In Saturday’s spring game, it was Browning with the first-team defense, which tells you that he has played solidly this spring as well. 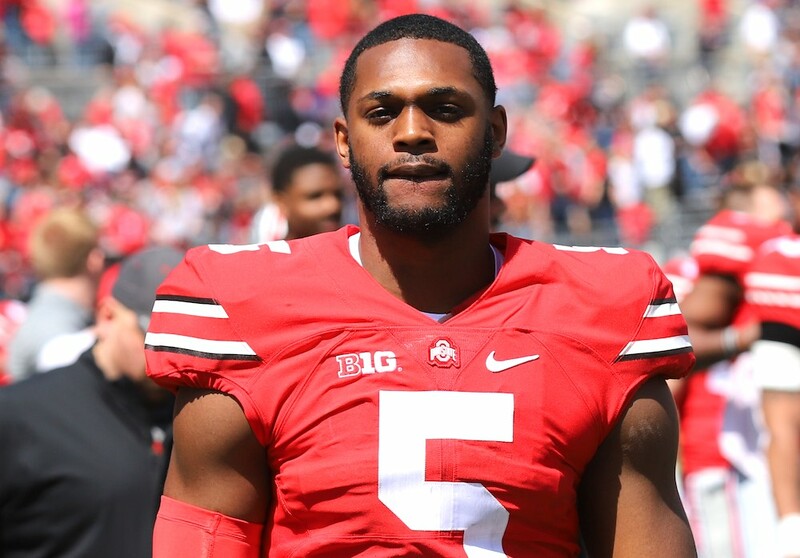 The media will speak with the Buckeye assistants this week in order to recap the spring and preview the summer, so we’ll get more information on the battle at middle linebacker from linebackers coach Al Washington in the days to come. As of right now, however, Ohio State head coach Ryan Day believes that Mitchell and Browning have done enough to earn an open competition with Borland when fall camp gets underway in late July. “I think it’s going to keep rolling,” Day said. “Tuf’s been out with his knee. Baron’s had his hamstring. Teradja’s been there every day and doing a good job on special teams. I think it’s going to keep going into the preseason when we get everybody healthy and let those guys play. I’ve gone back through 2017 and 2018 and specifically dialed in on Tuf Borland. In 2017 Tuf was a downhill bone jarring heat seeking missile. He made some rookie mistakes, but he was a dyed in the wool baller. That same guy didn’t play in 2018. At no point in 2018 did Tuf play even close to his worst game in 2017. There’s just no doubt in my mind that his Achilles injury was the reason for it. That player from 2017 was plenty fast, almost always in the right gaps and when he made contact, the ball carrier or blocker knew he had been contacted by a guy with really bad intentions. And the Achilles injury to a pathetic defensive scheme and Tuf becomes the focal point of an awful lot of criticism. Even AJ stayed away from this forum because of the animosity toward his brother. Tuf shouldn’t have played in 2018 and that’s just a fact. His mind I’m sure was amped up and he wanted to make plays like he did in 2017. The problem is that the mind is the least of a MIKE’S qualifiers. Without the wheels simple plays become nearly impossible plays. Idf your feet aren’t right, no amount of position knowledge is going to matter. You can’t get off blocks, can’t fill the gaps the way you’re supposed to, and you can absolutely forget about stretching plays east and west. Running backs and receivers will just blow past you like you’re standing still. The enforcer between the first and second level is gone and that leaves a prairie of wide open field for an offense to run free in. The MIKE is the quarterback of the defense and just like if the quarterback of the offense is off and the offense sputters, so does the defense. If Tuf is 100%…………..let the dust up shake out the starter. If he’s still not 100%……………..we have Mike D’Andrea 2.0 on our hands. Oh, Tony, I certainly hope that you are right about the open competition between Borland, Mitchell, and Browning. That truly needs to happen, without it being a hoax (i.e. saying it’s a competition, but knowing all along that Borland will be given the job as an incumbent). If this competition does happen, and it’s a legit competition, my shekels are on Browning to win the job. He’s the best option of which I’m aware. I couldn’t agree more about Borland, Longtime Fan: he was a disaster last year. I know Tony likes to keep a zipped lip about this situation, but if he were under Chinese water torture, I’m confident he would say the same thing. We need someone way more nimble, yet powerful, at MLB. Borland isn’t anywhere close to the McMillans, Laurinitises, Katzenmoyers, or Spielmans of the world. Even when he’s “up to speed,” I don’t think he can move from his C-class to their A-class. It’s really time to stop floundering at this crucial position. Somebody not named Borland needs to step up, and some coach with marbles needs to step up and demand that that guy plays. Pure and simple. Yes, call me blunt. That’s what grey hair earns you. I remain optimistic that the BEST 3 linebackers will be on the field come game 1. Otherwise, we could be in a for a “rinse and repeat” of 2018 LB play. As I said before, the damage Schiano left behind will be felt for a couple of years. The only LB from the three from last year that should have been on the field was Harrison. The other two were the result of Schiano ‘s complex scheme. I would argue those two are not OSU material and they should have never been recruited to come to OSU. LB recruiting fell off for a couple of years and there was a huge decline. They took risk on a couple of kids and missed misrabally. Now the kids that should have been on the field last year are one or two years behind. They could not be on the field more often because they were asked to do too much. 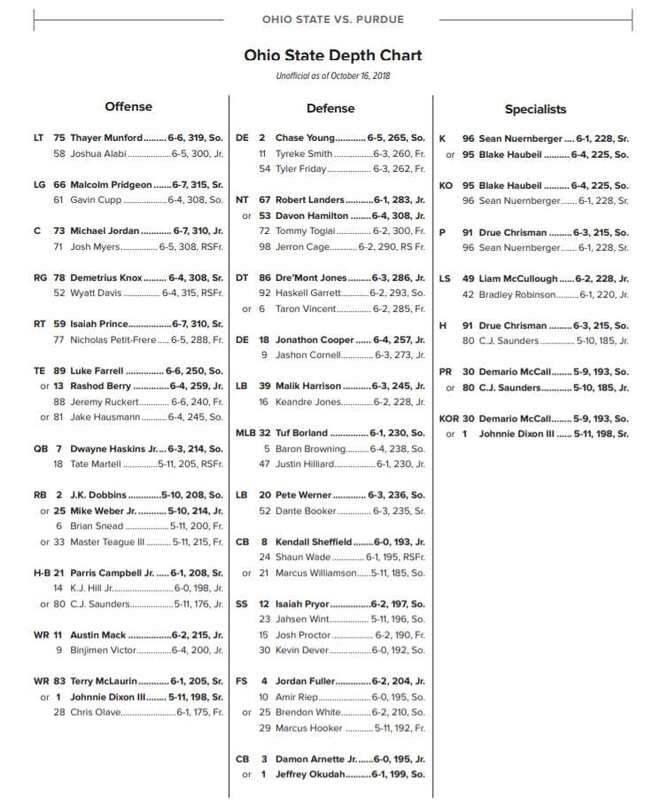 Hopefully with a simpler scheme any of them will be more productive than 0 tackles for all LB’s in a game. That is a shameful record that will never be broken. They’d better bring in a couple of high quality LB’s this year and next if they want to fix this quickly. The best man was the worst not a very good recruiter hopefully his replacement can do better. 1) It is very encouraging that the HC said the competition is open now. This is a much better approach than picking favorites and insisting they start, which happened last year for sure. 2) Reading between the lines, specifically with regard to middle linebacker, there may simply not be a good answer right now. Unless T Mitchell can’t walk and chew gum at the same time- which I doubt with every fiber of my being- I’d be tempted to give him the nod based on the substandard stuff we saw from the Middle all of 2018. 3) Minor fix- Tuf Borland never made it “up to speed” in 2018, unless that speed was slow. He had no business playing the first 8 games minimum.